The more hours you book, the cheaper it gets! Need lights? Ask about our "Light the Cyc Special", a choice of 3 lights from our Equip Hire page for only $75 (inc GST) per day. Visit our Equip Hire page for camera and lighting rental. Green screen, staging or martial arts mats can be added for only a $75 (inc GST) fee. Booking Studio 2 but need a little extra space for your crew? 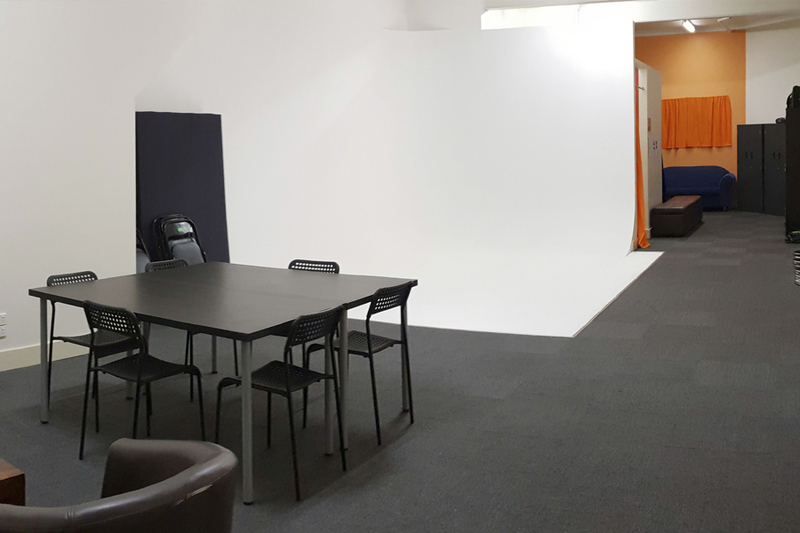 Add the Meeting Space (below) for a $50 (inc GST) flat daily fee. Book the whole building for your crew and get full access to Studios 1, 2 and the Meeting Space, hassle free! - Booking a full day hire? Agree to promote your time at DCF Studios on social media for a 10% discount off all your studio and equip hire costs. * Please note social media discount DOES NOT apply to bookings of less than 8 hours. - Need a few days in studio? Interested in weekly, monthly or long term hire? Ask us about discount pricing options. - Cash is not kept on the premise. Payment is in advance via direct debit or credit card only. No exceptions. - Payment must be made a minimum 24 hours prior to confirm staff on site. Failure to do so will result in cancellation. - A security bond of $300 is required for all bookings. This is fully refunded following your booking assuming all terms and conditions are met and no additional charges apply (such as overtime, extra equipment hire or damages). - All hire costs and the security bond must be paid in full to secure your booking date/times. We do not accept deposits. - We will endeavour to provide you with your preferred date/times, however please note we are a “by appointment” venue. Hire spaces and dates cannot be put on hold. Your booking is only secure once full payment of hire cost and bond are received. - Once your booking is confirmed, you may wish to make minor changes, such as adjust times or add equipment hire. DCF Studios will always endeavour to accommodate such changes, however we do reserve the right to refuse changes should they negatively impact other clients or business operations. - In you need to reschedule your booking please give DCF Studios as much notice as possible. If you need to cancel your booking, any refund of hire costs (whether partial or full) shall be granted solely at the discretion of DCF Studios. - Please note equivalent hire charges will incur for bookings that run overtime, payable by the half hour.